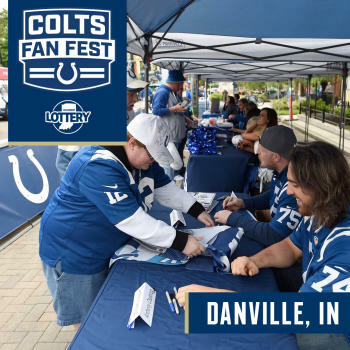 If you&apos;re a fan of the Indianapolis Colts, Thursday is the day that you want to visit Hendricks County, Indiana, because the Indianapolis Colts Fan Fest is coming to the historic Courthouse Square in Danville! That&apos;s right! 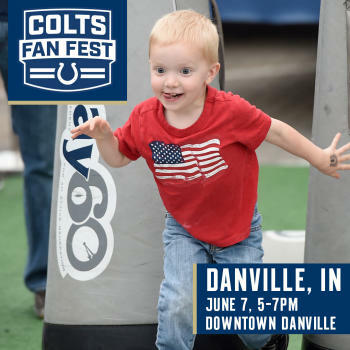 This Thursday, June 7, from 5 to 7 p.m., come out to Danville to meet some Colts players, snag some autographs and photos, high-five Blue and get hyped for the upcoming Colts season! Highlighting the Colts Fan Fest will be offensive tackle Anthony Castonzo and safety Clayton Geathers. Castonzo, a first-round pick by the Colts in 2011 out of Boston College, is responsible for protecting Andrew Luck&apos;s blind side at left tackle, and he&apos;s one of the best and most durable linemen in the NFL. Geathers, a fourth-round pick by the Colts in 2015 out of Central Florida, has racked up 101 tackles for the blue and white. Families will have the opportunity to meet Castonzo and Geathers, get their autographs and snap a photo with them during the Colts Fan Fest. Also in attendance will be the Colts&apos; fun-loving mascot, Blue, as well as a Colts cheerleader. In addition to meeting these Colts personalities, fans can register to win free tickets to Colts games, join some of the official Indianapolis Colts fan clubs, grab some Colts giveaways and learn how to become a season ticket holder. Visitors also can explore Colts in Motion, the team&apos;s traveling museum, and enjoy the NFL Play 60 Zone, interactive inflatables and live music. Pick up some new Colts gear while you&apos;re there, too, at the mobile Colts shop. It&apos;s going to be a blast! Fans will want to arrive a little early to the Colts Fan Fest because it&apos;s going to be a popular event, and the autograph line may be cut off at any time to keep the tour on schedule. Also, team obligations may require the players to arrive a little late or have to leave early, so pack a little extra patience and understanding. Another good reason to arrive early is that each fan is limited to one autograph per person. After you get your one autograph, though, you can get back in line for an additional signature, so leave yourself plenty of time if you have multiple items that you want autographe d.
While Castonzo and Geathers are slated to appear, stuff can happen at the last minute, resulting in different players making appearances, instead. Just bring your Colts spirit and celebrate any player who&apos;s there. Finally, the Colts Fan Fest is a rain-or-shine event, so make sure you dress for the weather. Wear your blue and white on Thursday, and make your way to the historic Hendricks County Courthouse Square in Danville from 5 to 7 p.m. for a fun, interactive experience that will get you fired up for the 2018 Indianapolis Colts season! Hendricks County Courthouse Square, Danville, Ind.